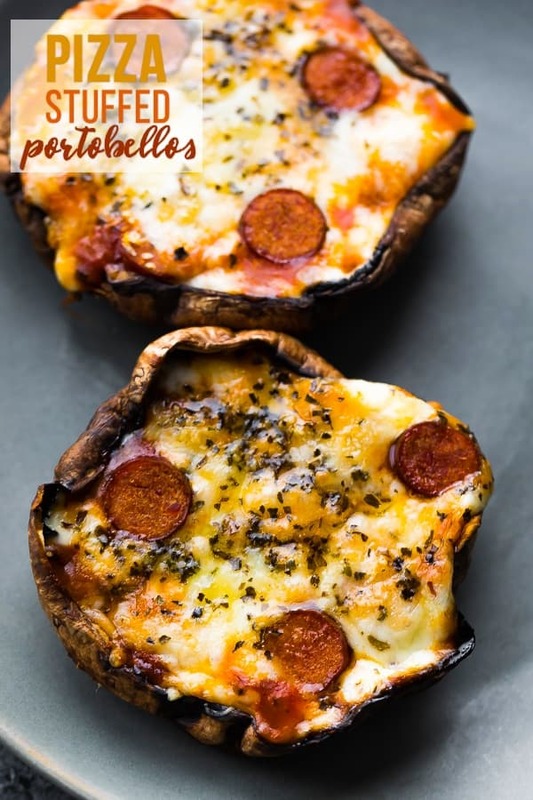 Pepperoni pizza stuffed portobello mushrooms are a simple low carb dinner recipe, and also make a delicious meal prep lunch! Disclaimer: this post was sponsored by Grimm’s Fine Foods. Thank you for supporting the brands that I love! Now that I’ve gotten your attention with that glorious CHEEEEESE, can we also talk pepperoni? 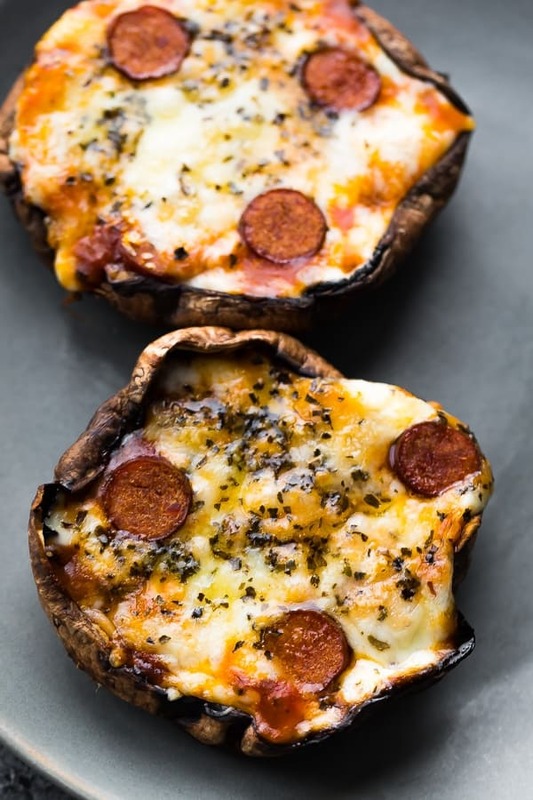 Because these pepperoni pizza stuffed portobello mushrooms are made with my favourite Lean Turkey Pepperoni from Grimm’s Fine Foods. I love the clean ingredient list, the fact that it’s gluten, lactose and MSG free, and it’s a delicious savory snack is portable and full of protein to fill you up! I love keeping my fridge stocked with Grimm’s Lean Turkey Pepperoni because it’s such an easy snack to grab. Often I will have two pepperoni sticks for my mid-afternoon snack and they keep me full until dinner! 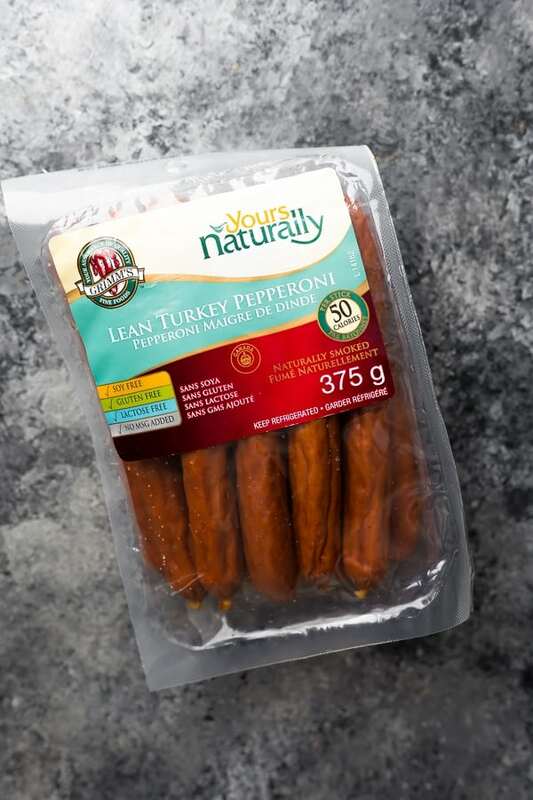 Be sure to check at your local grocer for Grimm’s Lean Turkey Pepperoni, or the Grimm’s website for availability. I figured that these pepperoni pizza stuffed portobello mushrooms were the perfect way to use my Lean Turkey Pepperoni! I’m hooked on stuffed portobello mushroom recipes because you can turn your favorite comfort food into a guilt-free meal. I’ve previously made Enchilada Stuffed Portobellos and Lasagna Stuffed Portobellos, and so clearly it was time for portobello mushroom pizzas! Pull out the stems and reserve. Scoop out the gills with a spoon and discard. Brush mushrooms with olive oil and salt & pepper. Fill with your favorite pizza toppings! I used chopped mushroom stems, tomatoes, Grimm’s Lean Pepperoni Sticks and onions. Cheese it up: I used shredded mozza and a generous sprinkling of parmesan. Do these portobello mushroom pizzas really last as a meal prep lunch? YES. I was dubious myself, but the mushrooms did not get soggy and were really delicious after heating through in the microwave. I recommend packing with a few extra pepperoni sticks and some fruit (see below). Can I grill these portobello mushroom pizzas? I haven’t tested this, but I bet that would work great! Refer to the directions in my Enchilada Stuffed Grilled Portobellos. 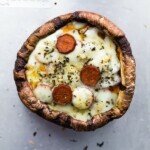 What other toppings can I use for these portobello mushroom pizzas? You can go wild! I bet bell peppers, olives, pineapple and hot peppers would all be great. I bet using pesto or salsa in place of pizza sauce would be great, too! 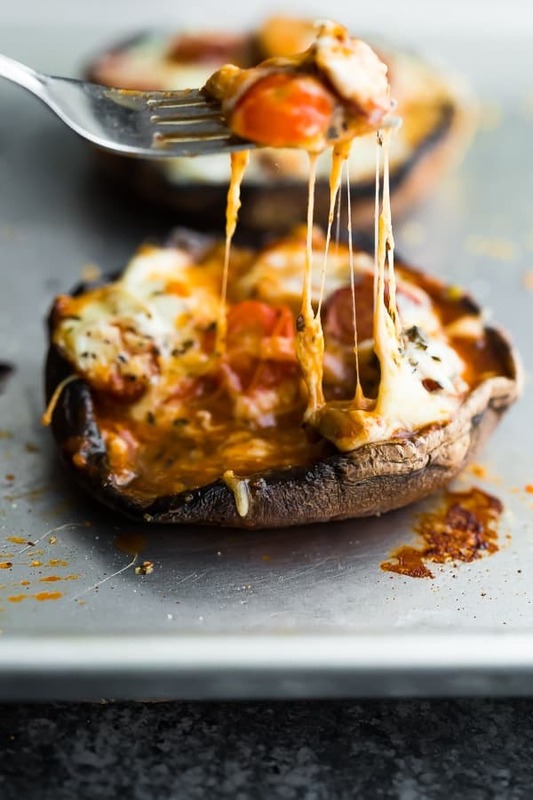 What to serve with this pepperoni pizza baked portobello mushroom? extra pepperoni sticks and some berries for a healthy lunch on the go! 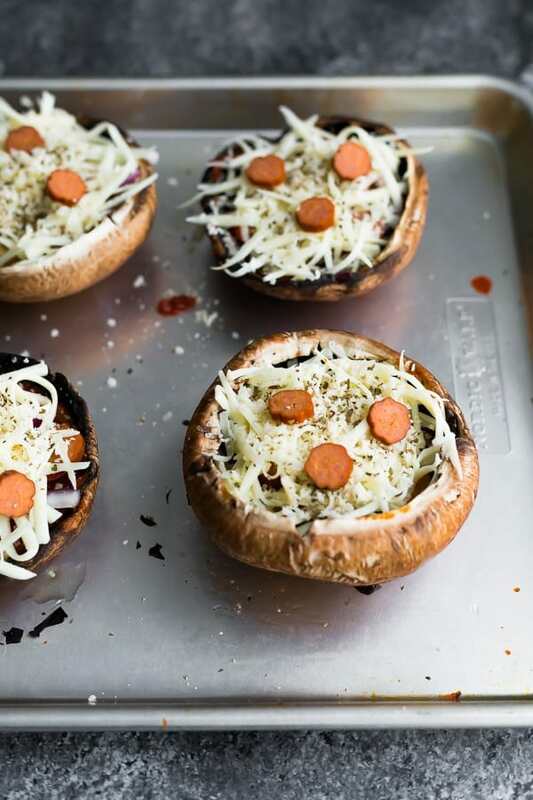 Pepperoni pizza stuffed portobello mushrooms are a simple low carb dinner recipe. 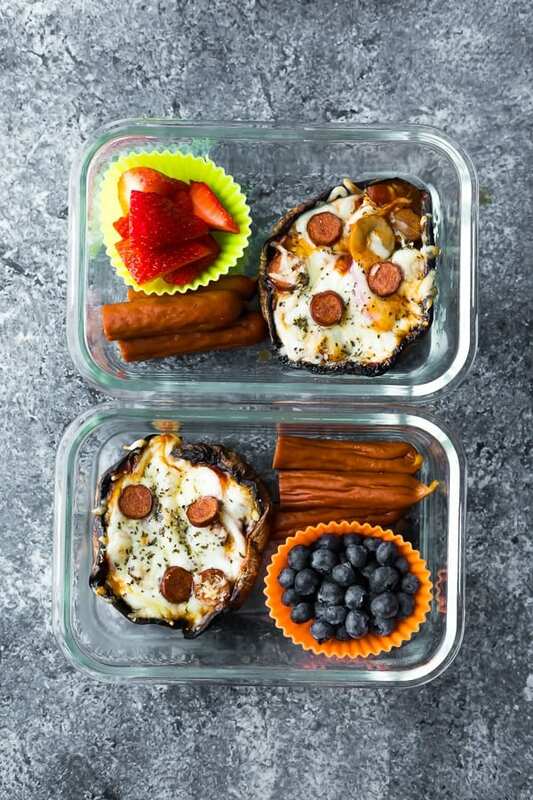 Portobello mushroom pizzas also make a delicious meal prep lunch! Heat oven to 400°F (if you have convection, use this setting). Prepare the portobello mushrooms: remove the stems (reserve for filling) and scoop out the gills. Fill your 'pizzas': 2 tablespoons pizza sauce per mushroom, followed by Grimm's Lean Turkey Pepperoni Stick slices, cherry tomatoes, onions and chopped mushroom stems. Top with 1/2 cup shredded mozzarella, then a sprinkling of parmesan and basil. Add a few extra pepperoni slices. Bake in pre-heated oven on a baking sheet for 18-25 minutes, until cheese is melted and bubbly. Mushroom pizzas may be stored in a sealed container in the fridge for up to 4 days. Reheat until steaming hot and cheese is melted. That’s such a great idea, Delores! I haven’t tried but I bet it would work.